Paper Trees is a unique collection of hand-drawn family trees and charts which you can fill in and color by yourself (by computer or by hand). All of these beautiful designs are original, and they are available as clip-art for use as family gift cahrts, cards, announcements, book covers, section dividers, reunion T-shirts and mugs, newsletter designs, research aids, or for any of a thousand other things. Filled in by hand, calligraphy, or type, and hand-colored in pen, paint, or computer program (like Photoshop Elements), each of these family trees is guaranteed to be unique, and each illustration--whether elegant, whimsical, or just plain folksy--is a joyful celebration of your family. Uses for it are limited only by your imagination. Anyone purchasing a copy of this book after October 29, 2012 will automatically get a free copy of the Fun Pedigree Charts brochure, which explains how to use a Flip-Pal mobile scanner, and Photoshop Elements 10 with the charts found in Paper Trees to produce unique and personalized gifts for family and friends. "If you need a wide variety of charts, this book would be useful..."--FEDERATION OF GENEALOGICAL SOCIETIES FORUM, Vol. 11, No. 3 (Fall 1999), p. 34. 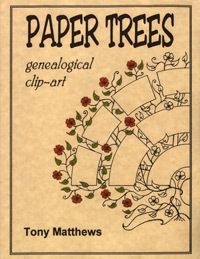 Click here to see the Paper Trees Genealogical clip-art book review at GenealogyBlog.com.